Well ladies and gentlemen, one year ago I began this blog in earnest. While the official first post went up a couple months before that, it wasn’t until March that I really hit my stride and began running this blog in more or less its present form. I am inordinately proud to say that in that year, I have never missed a post (despite some close calls around Christmas and while I was traveling). I like to think that my consistency is part of the reason why, in my opinion, this blog has been as successful as it has been. Since this blog was started, I’ve had a staggering 49,887 hits (give or take a few, depending on what time you’re reading this). A good chunk of those are thanks to being linked a handful of times from Pharyngula, but surprisingly the most popular post got most of its traffic from Stumbleupon, so whoever “Stumbled” it, you have my thanks. As it stands now, I am averaging around 100 hits per day, which has been steady since the new year. There are a total of 381 posts (including this one) on the site. Assuming an average of ~750 words per post (I aim for 1000, but some of them are short mini-posts so I am rounding down), that’s a total of 285,750 words all told (roughly the same number that are in a Harry Potter book, apparently). You and I have contributed a total of 1,236 comments to these posts, the only ones of which I have deleted being my own (and one that was a response to one that I deleted, so I deleted it because it wouldn’t make any sense out of context). And spam, obviously (2,100 spam comments deleted – go Akismet!). 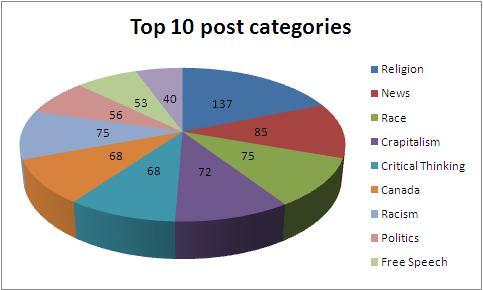 The following graph shows the breakdown of the top 10 subjects tagged in my posts. Please keep in mind that each post may (and often does) have several different tags at the same time. ﻿ It’s perhaps unsurprising that religion is such a large slice of the pie chart, as many of my thought pieces have been on that topic. The interests of this blog have bloomed from simply talking about race, religion and free speech, and a similar chart drawn a year from now will probably look very different. When I started this blog, it was largely at the request of friends, and also partially to (unsuccessfully) impress a girl – side note: there is a girl (and I’m pretty sure she’s the only one) who is impressed by a guy who blogs about race, religion and free speech, but she lives very far from me so I’ll have to fall back on the whole “being a rock star” thing for now. I didn’t have a coherent idea of what I was going to do at the time, but in the past year I’ve become more aware of where the niches are in the blogosphere, and I am going to try and exploit some of those more directly. I plan on retiring and replacing the current theme/background. While it has served me quite well, it’s time for a change. I plan to register the domain crommunist.com and take WordPress out of the title, so look forward to that (if you have bookmarks don’t worry: you will be automatically forwarded). I’m also going to reach out to some of the blogs I read and see if I can get some more collaboration going on. The only fallout from all of this for you, my dear readers, is that there will be the same content (possibly more) with a new shiny look. It’s been a great year for me, both blog-wise and life-wise. I’m looking forward to more great things in the coming year. You readers have been a big part of what made this so great – there were times when I felt like giving up and putting the whole “blog” thing on hiatus, but knowing you’re out there and reading my random cranial ejaculations keeps me focussed. The many supportive comments and e-mails I’ve received mean more to me than you know. A quick note to the few of you who have hung around to disagree with me: while I may not always be charitable in my responses, I do value your input and am glad to have opposing viewpoints expressed here. Anyway, thanks for making this such a great year for me, and I promise I’ll keep doing my part! I would have thought religion would be a larger slice. For what it’s worth, you’re a daily read for me, as I really enjoy your posts. Black History Month in Canada was really great. I’m actually surprised you don’t get more hits per day, given the high quality of your stuff, but I suppose word of mouth has a lot more to do with popularity than quality. Congrats, I can’t believe it’s been a year! Let me know if you want any help with the makeover. (I’d also suggest using the disqus commenting platform). Pie graph! Love. Happy blogoversary.